St Frances, born two months premature, was the youngest of eleven children. Her family had a wealthy cherry tree farm at Lodi in Italy. Only four of her brothers and sisters survived to adulthood. At 13, St Frances attended a Daughters of the Sacred Heart School and six years later, qualified as a teacher. St Frances was refused entry as a Novice/Nun to the Daughters of the Sacred Heart Order. 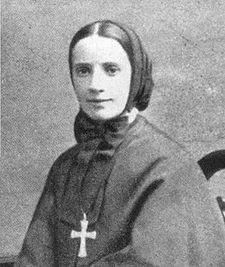 However, in time, she became Headmistress of an orphanage and then formed her own religious order, the Missionary Sisters of the Sacred Heart. Along with other women, St Frances took religious vows and established day schools, nurseries, skills centres and homes for orphans and the poor. In 1889, St Frances set off for New York, along with six of her Sisters, to help the many impoverished Italian immigrants arriving there at that time. They continued the Orders great work of tending to the many orphaned children, the sick and the poor. In total, St Frances set up 67 institutions ranging from homes to hospitals throughout North and South America and Europe. She remained the Orders Superior General until her death. St Frances’ Feast Day is the 13th November. She is the Patron Saint of immigrants. Pray that we will see the poor and marginalised as members of our own family and reach out to welcome and help them.